Obese are more prone to asthma than those of normal weight. Th2 cells – specialised cells belonging to the immune system can inflame the lungs and contribute to the development of asthma. Th2 cells also produce a protein known as PMCH which is known to increase appetite. In one of the several European and American studies which was published earlier this year, out of 330,000 patients, for every normal weight person with asthma, 1.5 who were overweight or obese. Although researchers wrote that “These findings may provide a mechanistic link between allergic inflammation, asthma and obesity,” as people with asthma are not always obese, further investigation was needed into possible genetic variations of PMCH. What has cat whiskers got to do with your kidneys ? That was exactly what I asked when I was given the product, Good Image Cat Whiskers Tea. 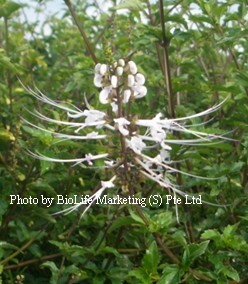 Cat Whiskers good for cleansing and strengthening kidneys ? As I digged further, I began to love it. Besides its aroma, it is a nice detox tea for cleansing the kidney and urinary tract. Instead of keeping a cat at home, I am looking forward to growing this beautiful herb in my little balcony and touching its whiskers. It has been called Kidney Tea, Holy Tea, Toddler Tea, Stone Removal Herb, Ageless Herb, Romance Herb and Cat Whiskers Herb (click here) but its botannical name is Spicate Clerodendranthus. Although it can be found in Malaysia (called Misai Kuching or Misai Kucing), I can’t wait to visit Xishuangbanna in China Yunnan Province to see the mu of Cat Whiskers.